A quark ( or ) is an elementary particle and a fundamental constituent of matter. Quarks combine to form composite particles called hadrons, the most stable of which are protons and neutrons, the components of atomic nuclei. Due to a phenomenon known as color confinement, quarks are never directly observed or found in isolation; they can be found only within hadrons, such as baryons (of which protons and neutrons are examples), and mesons. For this reason, much of what is known about quarks has been drawn from observations of the hadrons themselves. There are six types of quarks, known as flavors: up, down, strange, charm, Bottom quark, and Top quark. Up and down quarks have the lowest masses of all quarks. The heavier quarks rapidly change into up and down quarks through a process of particle decay: the transformation from a higher mass state to a lower mass state. Because of this, up and down quarks are generally stable and the most common in the universe, whereas strange, charm, bottom, and top quarks can only be produced in high energy collisions (such as those involving cosmic rays and in particle accelerators). Quarks have various intrinsic properties, including electric charge, mass, color charge and spin. Quarks are the only elementary particles in the Standard Model of particle physics to experience all four fundamental interactions, also known as fundamental forces (electromagnetism, gravitation, strong interaction, and weak interaction), as well as the only known particles whose electric charges are not integer multiples of the elementary charge. For every quark flavor there is a corresponding type of antiparticle, known as an antiquark, that differs from the quark only in that some of its properties have equal magnitude but opposite sign. Bowley, Roger; Copeland, Ed. "Quarks". Sixty Symbols. A. Ali, G. Kramer; Kramer (2011). 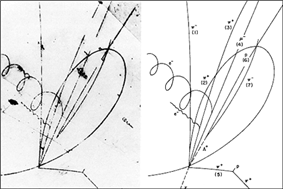 "JETS and QCD: A historical review of the discovery of the quark and gluon jets and its impact on QCD". ^ R. Nave. "Confinement of Quarks". ^ R. Nave. "Bag Model of Quark Confinement". ^ a b R. Nave. "Quarks". ^ a b c d B. Carithers, P. Grannis (1995). "Discovery of the Top Quark" (PDF). ^ a b E.D. Bloom et al. (1969). "High-Energy Inelastic e–p Scattering at 6° and 10°". ^ a b M. Breidenbach et al. (1969). "Observed Behavior of Highly Inelastic Electron–Proton Scattering". ^ S.S.M. Wong (1998). Introductory Nuclear Physics (2nd ed.). ^ K.A. Peacock (2008). The Quantum Revolution. ^ B. Povh, C. Scholz, K. Rith, F. Zetsche (2008). Particles and Nuclei. ^ Section 6.1. in P.C.W. Davies (1979). The Forces of Nature. ^ a b c M. Munowitz (2005). Knowing. E.V. Shuryak (2004). The QCD Vacuum, Hadrons and Superdense Matter. ^ D. Decamp; Deschizeaux, B.; Lees, J.-P.; Minard, M.-N.; Crespo, J.M. ; Delfino, M.; Fernandez, E.; Martinez, M. et al. (1989). "Determination of the number of light neutrino species". A. Fisher (1991). "Searching for the Beginning of Time: Cosmic Connection". J.D. Barrow (1997) . "The Singularity and Other Problems". The Origin of the Universe (Reprint ed.). ^ D.H. Perkins (2003). Particle Astrophysics. ^ a b M. Gell-Mann (1964). "A Schematic Model of Baryons and Mesons". ^ a b G. Zweig (1964). "An SU(3) Model for Strong Interaction Symmetry and its Breaking". CERN Report No.8182/TH.401. ^ Companion to the History of Modern Science. ^ A. Pickering (1984). Constructing Quarks. ^ J.I. Friedman. "The Road to the Nobel Prize". ^ R.P. Feynman (1969). "Very High-Energy Collisions of Hadrons". ^ S. Kretzer et al. (2004). "CTEQ6 Parton Distributions with Heavy Quark Mass Effects". ^ a b D.J. Griffiths (1987). Introduction to Elementary Particles. ^ M.E. Peskin, D.V. Schroeder (1995). An introduction to quantum field theory. ^ V.V. Ezhela (1996). Particle physics. ^ D.J. Griffiths (1987). Introduction to Elementary Particles. ^ M. Kobayashi, T. Maskawa; Maskawa (1973). "CP-Violation in the Renormalizable Theory of Weak Interaction". ^ a b H. Harari (1975). "A new quark model for hadrons". ^ a b K.W. Staley (2004). The Evidence for the Top Quark. ^ S.W. Herb et al. (1977). "Observation of a Dimuon Resonance at 9.5 GeV in 400-GeV Proton-Nucleus Collisions". ^ M. Bartusiak (1994). A Positron named Priscilla. ^ K.W. Staley (2004). The Evidence for the Top Quark. ^ "New Precision Measurement of Top Quark Mass". ^ J. Joyce (1982) . Finnegans Wake. ^ M. Gell-Mann (1995). The Quark and the Jaguar: Adventures in the Simple and the Complex. ^ J. Gleick (1992). Genius: Richard Feynman and modern physics. ^ J.J. Sakurai (1994). S.F Tuan, ed. Modern Quantum Mechanics (Revised ed.). ^ a b D.H. Perkins (2000). Introduction to high energy physics. ^ M. Riordan (1987). The Hunting of the Quark: A True Story of Modern Physics. ^ F. Close (2006). The New Cosmic Onion. ^ J.T. Volk et al. (1987). "Letter of Intent for a Tevatron Beauty Factory". Fermilab Proposal #783. ^ G. Fraser (2006). The New Physics for the Twenty-First Century. ^ D. Lincoln (2004). Understanding the Universe. ^ "Weak Interactions". Virtual Visitor Center. ^ K. Nakamura et al. (2010). "Review of Particles Physics: The CKM Quark-Mixing Matrix". J. Phys. G 37 (75021): 150. ^ Z. Maki, M. Nakagawa, S. Sakata (1962). "Remarks on the Unified Model of Elementary Particles". ^ R. Nave. "The Color Force". ^ B.A. Schumm (2004). Deep Down Things. ^ a b Part III of M.E. Peskin, D.V. Schroeder (1995). An Introduction to Quantum Field Theory. ^ V. Icke (1995). The force of symmetry. ^ M.Y. Han (2004). A story of light. ^ C. Sutton. "Quantum chromodynamics (physics)". ^ A. Watson (2004). The Quantum Quark. ^ W. Weise, A.M. Green (1984). Quarks and Nuclei. ^ D. McMahon (2008). Quantum Field Theory Demystified. ^ S.G. Roth (2007). Precision electroweak physics at electron–positron colliders. ^ a b M. Veltman (2003). Facts and Mysteries in Elementary Particle Physics. ^ F. Wilczek, B. Devine (2006). Fantastic Realities. ^ T. Yulsman (2002). Origin. 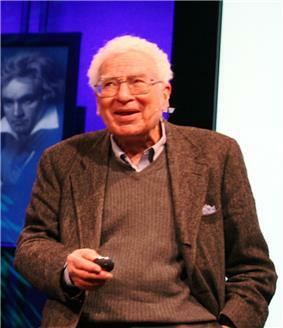 ^ J. Steinberger (2005). Learning about Particles. ^ C.-Y. Wong (1994). Introduction to High-energy Heavy-ion Collisions. ^ S.B. Rüester, V. Werth, M. Buballa, I.A. Shovkovy, D.H. Rischke; Werth; Buballa; Shovkovy; Rischke (2005). "The phase diagram of neutral quark matter: Self-consistent treatment of quark masses". ^ M.G. Alford, K. Rajagopal, T. Schaefer, A. Schmitt; Schmitt; Rajagopal; Schäfer (2008). "Color superconductivity in dense quark matter". ^ S. Mrowczynski (1998). "Quark–Gluon Plasma". ^ Z. Fodor, S.D. Katz; Katz (2004). "Critical point of QCD at finite T and μ, lattice results for physical quark masses". ^ U. Heinz, M. Jacob (2000). "Evidence for a New State of Matter: An Assessment of the Results from the CERN Lead Beam Programme". arXiv:0002042 [nucl-th]. ^ "RHIC Scientists Serve Up "Perfect" Liquid". ^ T. Yulsman (2002). Origins: The Quest for Our Cosmic Roots. ^ A. Sedrakian, J.W. Clark, M.G. Alford (2007). Pairing in fermionic systems. ^ Several research groups claimed to have proven the existence of tetraquarks and pentaquarks in the early 2000s. While the status of tetraquarks is still under debate, all known pentaquark candidates have since been established as non-existent. ^ The main evidence is based on the resonance width of the Z0 boson, which constrains the 4th generation neutrino to have a mass greater than ~45 GeV/c2. This would be highly contrasting with the other three generations' neutrinos, whose masses cannot exceed 2 MeV/c2. Under sufficiently extreme conditions, quarks may become deconfined and exist as free particles. In the course of asymptotic freedom, the strong interaction becomes weaker at higher temperatures. Eventually, color confinement would be lost and an extremely hot plasma of freely moving quarks and gluons would be formed. This theoretical phase of matter is called quark–gluon plasma. The exact conditions needed to give rise to this state are unknown and have been the subject of a great deal of speculation and experimentation. A recent estimate puts the needed temperature at (1.90±0.02)×1012 Kelvin. While a state of entirely free quarks and gluons has never been achieved (despite numerous attempts by CERN in the 1980s and 1990s), recent experiments at the Relativistic Heavy Ion Collider have yielded evidence for liquid-like quark matter exhibiting "nearly perfect" fluid motion. −60 denotes measurement uncertainty. In the case of the top quark, the first uncertainty is statistical in nature, and the second is systematic. The Standard Model posits that elementary particles derive their masses from the Higgs mechanism, which is related to the Higgs boson. Physicists hope that further research into the reasons for the top quark's large mass of ~173 GeV/c2, almost the mass of a gold atom, might reveal more about the origin of the mass of quarks and other elementary particles. Two terms are used in referring to a quark's mass: current quark mass refers to the mass of a quark by itself, while constituent quark mass refers to the current quark mass plus the mass of the gluon particle field surrounding the quark. These masses typically have very different values. Most of a hadron's mass comes from the gluons that bind the constituent quarks together, rather than from the quarks themselves. While gluons are inherently massless, they possess energy – more specifically, quantum chromodynamics binding energy (QCBE) – and it is this that contributes so greatly to the overall mass of the hadron (see mass in special relativity). For example, a proton has a mass of approximately 938 MeV/c2, of which the rest mass of its three valence quarks only contributes about 11 MeV/c2; much of the remainder can be attributed to the gluons' QCBE. In modern particle physics, gauge symmetries – a kind of symmetry group – relate interactions between particles (see gauge theories). Color SU(3) (commonly abbreviated to SU(3)c) is the gauge symmetry that relates the color charge in quarks and is the defining symmetry for quantum chromodynamics. Just as the laws of physics are independent of which directions in space are designated x, y, and z, and remain unchanged if the coordinate axes are rotated to a new orientation, the physics of quantum chromodynamics is independent of which directions in three-dimensional color space are identified as blue, red, and green. SU(3)c color transformations correspond to "rotations" in color space (which, mathematically speaking, is a complex space). Every quark flavor f, each with subtypes fB, fG, fR corresponding to the quark colors, forms a triplet: a three-component quantum field which transforms under the fundamental representation of SU(3)c. The requirement that SU(3)c should be local – that is, that its transformations be allowed to vary with space and time – determines the properties of the strong interaction, in particular the existence of eight gluon types to act as its force carriers. e) (see picture). This occurs when one of the down quarks in the neutron (udd) decays into an up quark by emitting a virtual W− boson, transforming the neutron into a proton (uud). The W− boson then decays into an electron and an electron antineutrino. Spin can be represented by a vector whose length is measured in units of the reduced Planck constant ħ (pronounced "h bar"). For quarks, a measurement of the spin vector component along any axis can only yield the values +ħ/2 or −ħ/2; for this reason quarks are classified as spin-1⁄2 particles. The component of spin along a given axis – by convention the z axis – is often denoted by an up arrow ↑ for the value +1⁄2 and down arrow ↓ for the value −1⁄2, placed after the symbol for flavor. For example, an up quark with a spin of +1⁄2 along the z axis is denoted by u↑. The quark flavors were given their names for a number of reasons. The up and down quarks are named after the up and down components of isospin, which they carry. Strange quarks were given their name because they were discovered to be components of the strange particles discovered in cosmic rays years before the quark model was proposed; these particles were deemed "strange" because they had unusually long lifetimes. Glashow, who coproposed charm quark with Bjorken, is quoted as saying, "We called our construct the 'charmed quark', for we were fascinated and pleased by the symmetry it brought to the subnuclear world." The names "bottom" and "top", coined by Harari, were chosen because they are "logical partners for up and down quarks". In the past, bottom and top quarks were sometimes referred to as "beauty" and "truth" respectively, but these names have somewhat fallen out of use. While "truth" never did catch on, accelerator complexes devoted to massive production of bottom quarks are sometimes called "beauty factories". In the following years a number of suggestions appeared for extending the quark model to six quarks. Of these, the 1975 paper by Haim Harari was the first to coin the terms top quark and bottom quark for the additional quarks. Charm quarks were produced almost simultaneously by two teams in November 1974 (see November Revolution)—one at SLAC under Burton Richter, and one at Brookhaven National Laboratory under Samuel Ting. The charm quarks were observed bound with charm antiquarks in mesons. The two parties had assigned the discovered meson two different symbols, J and ψ; thus, it became formally known as the J/ψ meson. The discovery finally convinced the physics community of the quark model's validity. In a 1970 paper, Glashow, John Iliopoulos and Luciano Maiani presented further reasoning for the existence of the as-yet undiscovered charm quark. The number of supposed quark flavors grew to the current six in 1973, when Makoto Kobayashi and Toshihide Maskawa noted that the experimental observation of CP violation[nb 3] could be explained if there were another pair of quarks. The strange quark's existence was indirectly validated by SLAC's scattering experiments: not only was it a necessary component of Gell-Mann and Zweig's three-quark model, but it provided an explanation for the kaon (K) and pion (π) hadrons discovered in cosmic rays in 1947. George Zweig proposed the quark model in 1964. Elementary fermions are grouped into three generations, each comprising two leptons and two quarks. The first generation includes up and down quarks, the second strange and charm quarks, and the third bottom and top quarks. All searches for a fourth generation of quarks and other elementary fermions have failed, and there is strong indirect evidence that no more than three generations exist. [nb 2] Particles in higher generations generally have greater mass and less stability, causing them to decay into lower-generation particles by means of weak interactions. Only first-generation (up and down) quarks occur commonly in nature. Heavier quarks can only be created in high-energy collisions (such as in those involving cosmic rays), and decay quickly; however, they are thought to have been present during the first fractions of a second after the Big Bang, when the universe was in an extremely hot and dense phase (the quark epoch). Studies of heavier quarks are conducted in artificially created conditions, such as in particle accelerators. Quarks are spin-1⁄2 particles, implying that they are fermions according to the spin-statistics theorem. They are subject to the Pauli exclusion principle, which states that no two identical fermions can simultaneously occupy the same quantum state. This is in contrast to bosons (particles with integer spin), any number of which can be in the same state. Unlike leptons, quarks possess color charge, which causes them to engage in the strong interaction. The resulting attraction between different quarks causes the formation of composite particles known as hadrons (see "Strong interaction and color charge" below). The Standard Model is the theoretical framework describing all the currently known elementary particles. This model contains six flavors of quarks (q), named up (u), down (d), strange (s), charm (c), bottom quark (b), and top quark (t). Antiparticles of quarks are called antiquarks, and are denoted by a bar over the symbol for the corresponding quark, such as u for an up antiquark. As with antimatter in general, antiquarks have the same mass, mean lifetime, and spin as their respective quarks, but the electric charge and other charges have the opposite sign.